Never has a game’s title expected you to fail so much! When Ski Lifts Go Wrong is pretty much goading you in to to creating lifts that kill the people using them. And you will. A new game in the growing physics builder genre (is that even a genre yet? ), When Ski Lifts Go Wrong tasks you with the job of getting tiny skiers to their destination, past mountains, trees, spiky looking hills and other dangers. At your disposal are a series of bases, pulleys, wheels and other equipment. Getting everything to work as it should takes a little patience and a bit of luck. Your main enemy is gravity, with various obstacles following close behind. It’s certainly satisfying to watch the little ski jumpers finally getting to their destination, though but just as you think you’ve got the hang of getting a lift working, the game switches tack and presents you with a ski jump to build instead. As well as jumps and lifts, there are sections where you control the people themselves after building a jump. You’ll need to pick up a medal and get back to a certain point to properly complete these. It’s a great way to break up the gameplay a little so it’s not just all about those lifts. Graphics are a great mix of low polygon backgrounds and tiny people making it pretty clear where everything is at any time. It’s a typical indie game presentation in one respect but I assume this is deliberately chosen because it’s the best fit for the game. Given that each level has a variety of tasks to complete in order to get the full set of medals, there’s plenty of replay value here and you can even create your own puzzles. It’s just a pity you can’t share these online at the moment. 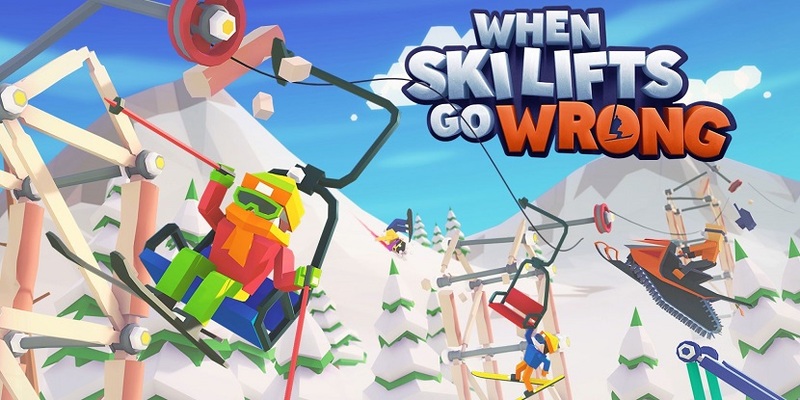 When Ski Lifts Go Wrong is a great addition to the physics puzzle genre and another great fun Switch indie game to check out.